Whether it is a commercial jetliner or a privately owned aircraft, BASF effect pigments can add differentiation to your design or aircraft appearance. Aircraft cabins are not exempt from style and luxury and hence are the perfect application area for effect pigments. 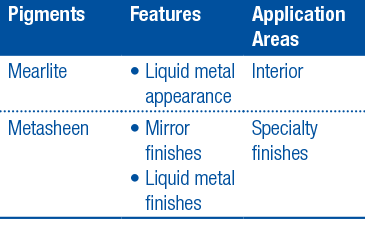 Mirror and liquid metal finishes are now available to the creative design engineer. Effect pigments can be used in plastic coatings to enhance the appearance and transform performance materials into unique design elements. Metasheen pigments create finishes with high luster and brightness. Often referred to as liquid metal, these effects are highly desired by the design community.